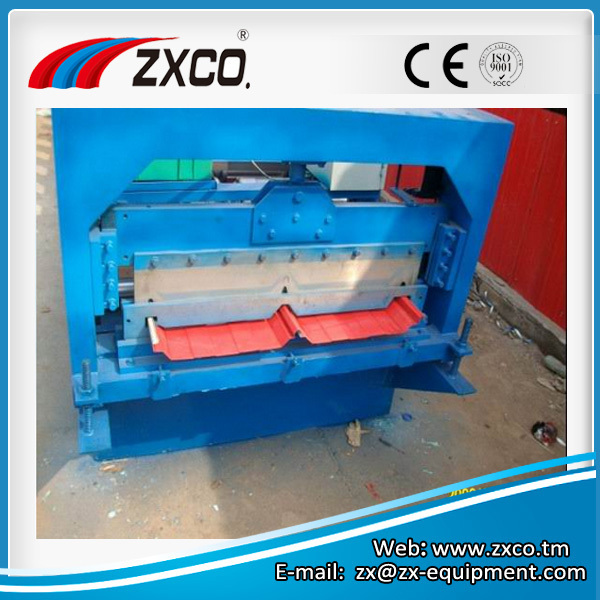 Concealed roof sheet molding machine is an undated version of traditional roll forming machine. Instead of using screws at joining position, the corrugated sheets produced by this line are Self-locked and have successfully solved the problem of leakage. The whole line consists uncoiler and its base, coil sheet guiding equipment, roll forming system, post-cutting equipment, and controlling system. 1. Size: 8000mm × 1500mm × 1600mm. 2. Total Weight: About 5500KG. 4. Main Motor Power: 5.5KW. The corrugated sheets produced by this line are strong and durable with high ribs. The joining type of these sheets is self-lock, which makes it easy to install and safe with excellent water proof and storm resistance. The products are widely used as the roof of factory, warehouse, garage, and gymnasium. Size of material: 1000mm × (0.4~0.8)MM × Lmm.